So glad I snapped a picture this morning so I didn't have to think of something right before bed again! Now this is something you won't see very often: Sophia's hair all neat and tidy. Not because we don't take care of it, but because it gets messed up very quickly. And no matter how I do her hair, it won't stay put. It's too slippery I guess. (These new StayPut elastics are great though.) This particular hair-do on this particular day was extremely short-lived. 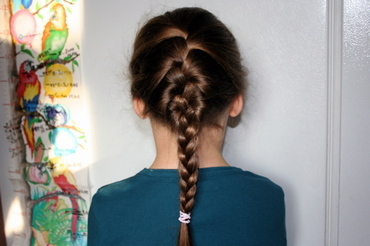 Sophia took one look in the mirror and said she didn't like "the front", so she promptly took out the elastic and the braid and that was the end of that. It's a good thing she doesn't do that very often.